We owe this one to my dear wife Monique, for she is the inspiration found in this recipe, she is always searching for new ingredients to cook and especially bake, desserts are her favorite. While flipping through several cookbooks in our collection, she ran across another for the 9×13 pan, and this happens to be about the sixth successful find in as many weeks. On Saturday, our dear friend Janet dropped by with a basket full of fresh ripe peaches that her dear husband Chris had picked up for us on his travels back from business in Atlanta. 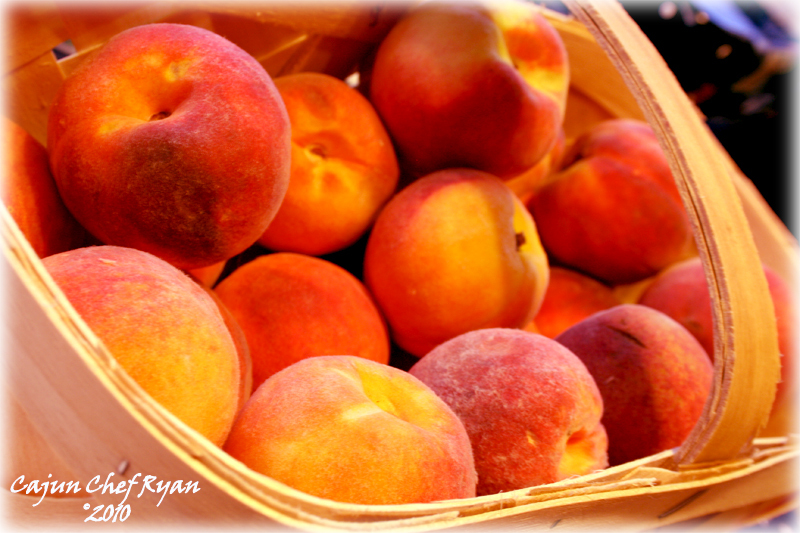 This was our second such basket of bountiful peaches bestowed upon us, and we had devoured the first basket before any hesitation of cooking their tender, juicy, flavorful fruit. This time around, we were not going to let them all go to just snacking, Monique had a mission. The basket purchased from roadside fruit stands near the Georgia and North Carolina borders, contains several varieties of locally grown peaches, including a white fleshed, orange fleshed, and several cling types. A cursory search for Georgia peaches turns out that there are 40 varieties available and grown in the state. It appears that our basket has three or four peach varieties included. These all seem like such great ingredients on their own, so why not put them together into one dish. If you can dream it you can believe it, all things start from a dream! I believe it is time to create a dreamy dessert! 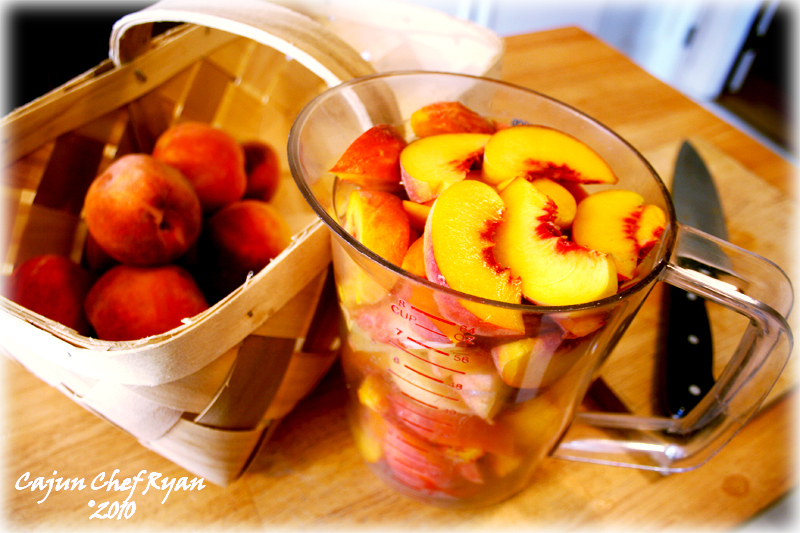 After slicing eight of the peaches for this recipe, it appeared that three varieties are in this particular basket; the noted tell tale flesh of each one with its varied color and texture. Each peach is cut from the top of the stem end and then around the circumference using the chef knife, then separated into two hemispheres exposing the firm yet juicy, tender flesh, and pit. With the pit removed, and using the chef knife again, all the peaches sliced into nice equal wedges, ten slices per peach in fact. We decided to keep the skin on because peeling them seemed like torture, and such a waste of good nutrition, not to mention the loss of the juicy, delicate, tender flesh. The pecan meats chopped with the chef knife, and then added to the melted butter, combined with brown sugar, thus transformed into the praline filling. Filling, a fruit concoction made with fresh, canned, or frozen fruit, mixed with water or fruit juice, thickened with cornstarch, and spices added, typically cooked until thick and bubbly. This is the fruit filling. 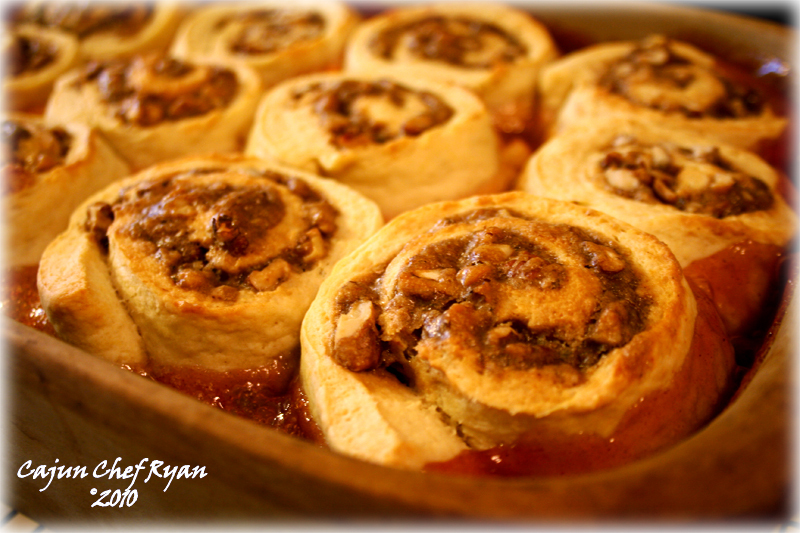 Dough, typically a sweet biscuit type, and this time turned on its head with the addition of the pecan praline filling in the fashion of a cinnamon or Danish roll. Yield 12 servings, pre-heat oven to 400° F.
1. 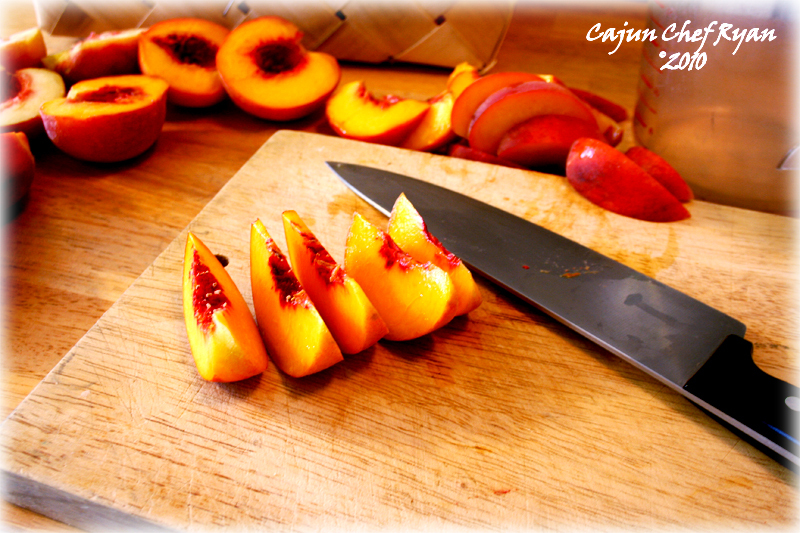 Cut the peaches into wedges and reserve. 2. In a large saucepot, combine the sugar, water, cornstarch, and cinnamon, stir to dissolve the sugar and cornstarch, then turn on the heat to medium and add the peaches. Stir well evenly coating the peaches, continue to cook until thickened, and just starts to bubble. Turn off the heat and cover, keep warm. 1. Melt the butter in a medium bowl, add the brown sugar, and then stir well to dissolve. 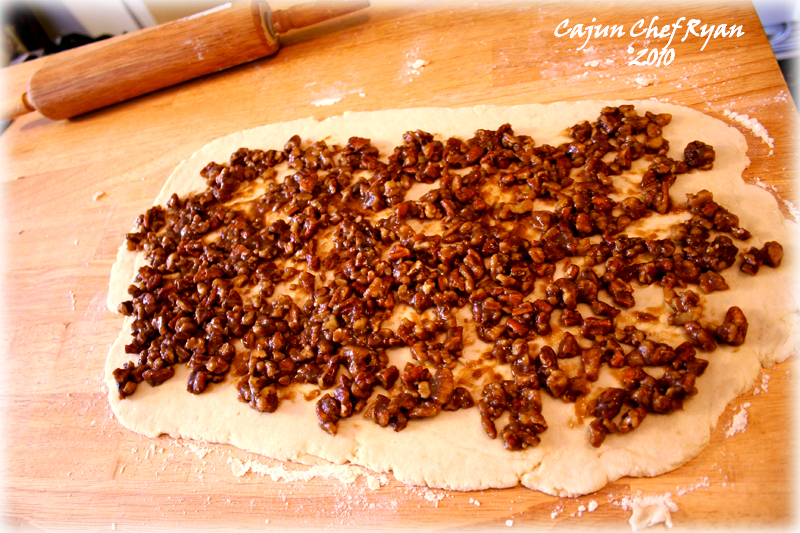 2 Add the pecans and stir until well and evenly coated, and then reserve for filling the dough. 1. In a small bowl combine the milk and lemon juice, and then set aside. 2. In the bowl of a food processor, combine the flour, brown sugar, baking powder, baking soda, and salt. If no food processor is available, use a large bowl. 3. Cut in the shortening or butter using the food processor, or in the case of manual cutting, use a pastry blender or pastry knife tool. Cut in the shortening until it resembles coarse crumbles. 4. Turn out the flour / shortening mixture into a large bowl and make a well in the middle. Add the milk mixture and stir just until the dough clings together and is in one solid mass. 5. 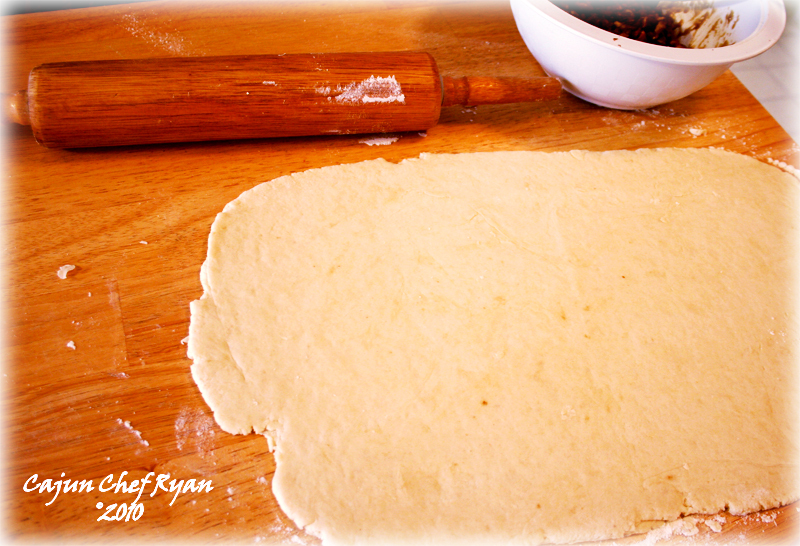 Turn the dough out onto a floured surface and kneed gently for ten to twelve turns. 6. Roll the dough into an 8-inch by 12-inch rectangle. 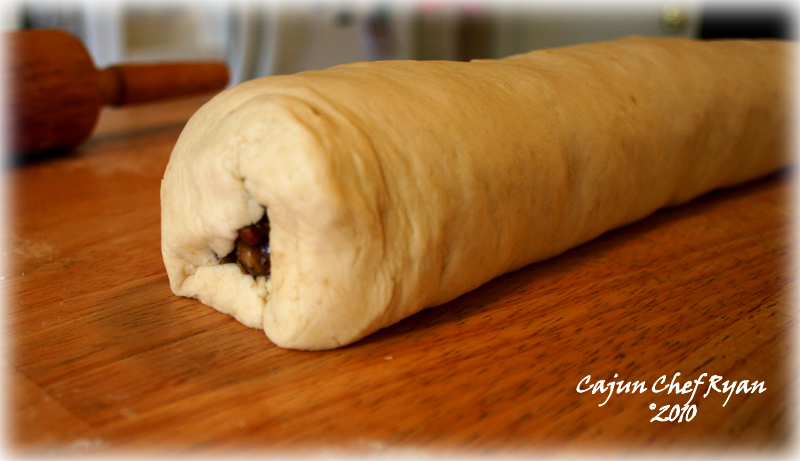 Then spread the reserved pecan praline filling evenly over the top of the dough. 7. 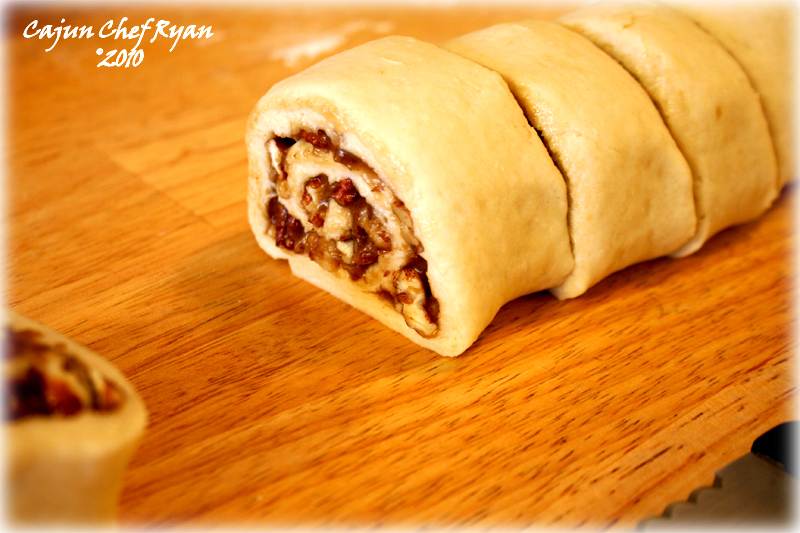 Roll up the dough from one of the long sides, and then cut into twelve 1-inch pieces. 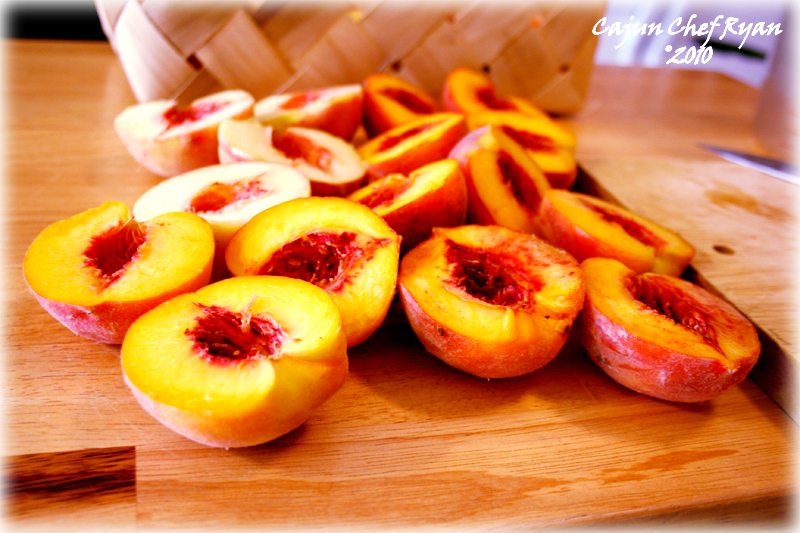 Transfer the hot peach filling into an ungreased 9×11 pan or baking dish. 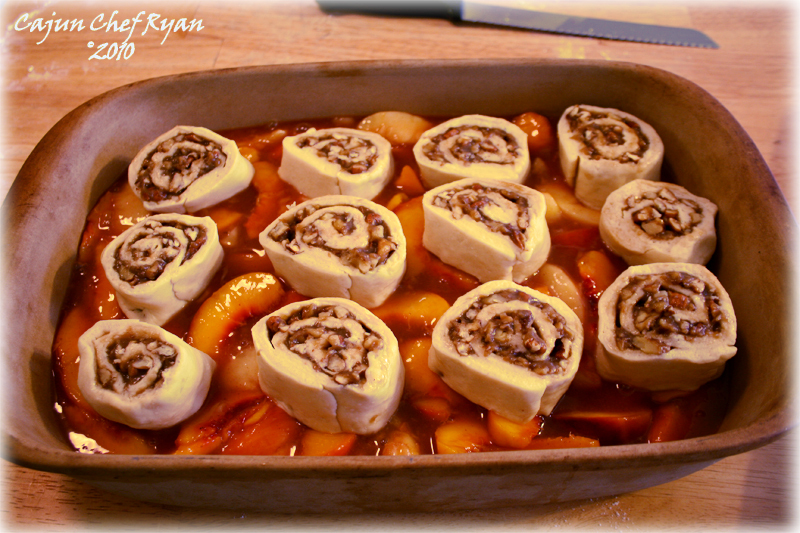 Place the filled dough rolls with the cut side down on top of the peaches. Bake uncovered for about 25 minutes or until golden brown on top and the dough appears fully baked. Cool in the pan on a wire rack for 30 minutes. Serve warm and if desired serve with heavy cream or half-and-half drizzle. That looks so awesome!! Thanks for the recipe! 40 kinds of peaches? Who knew?! This is a delectable looking take on cobbler. I’m about speechless. That looks amazing! I’m wishing I’d not made the blueberry crisp Monday night so I could try blueberries this way. Wow! Chef Ryan! Yes Yes oh so dreamy they are….and the sweet aroma taking over your kitchen! nice and warm with some vanilla ice cream on the side please. nice post and recipe. 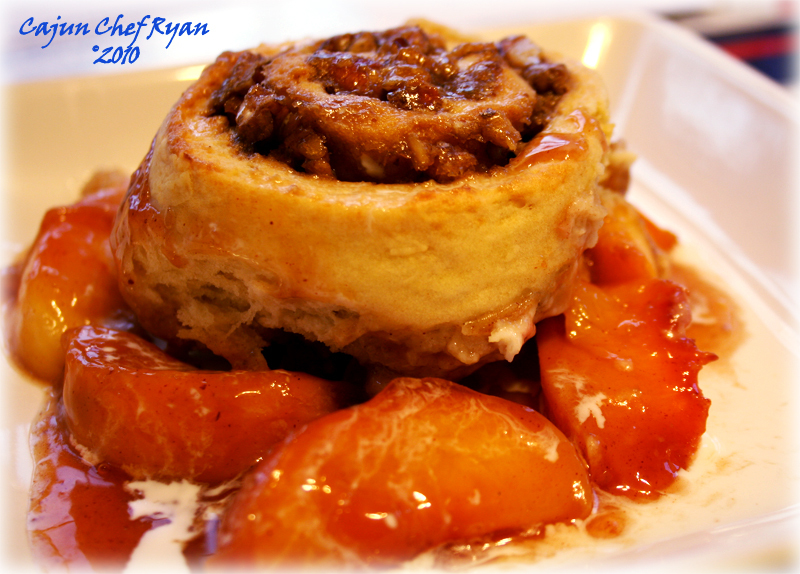 What a deliciously decadent twist on peach cobbler! Thanks for the step-by-step instructions and photographs – and I agree about not peeling the peaches. Mouthwatering , drool inducing recipe! Absolutely delicious cobbler. I bet it tasted amazing. Yum! That looks deadly good. I wish I could taste it. That is some recipe, and it looks amazing! I wish I can taste some right now. We just moved from GA not very long ago.. the praline topping makes me want to go back to River Street.. how delicious looking.. those peaches are gorgeous! Those peaches look so so fresh and pretty. This praline cobbler is dreamy indeed! This is an amazing recipe, perfect for a company dinner! You’ve made it look clear and simple in preparation. I’d love to try this one. AMAZING! I love the unique recipe – this is a winner!! Beautiful! I’m sure this a a real crowd-pleaser! Oh my gosh. That’s gorgeous. I have a bag full of peaches that a friend dropped off yesterday and now I know how I’ll use some. Thanks for the recipe! Chef Ryan, you took three of a southerners favorite things and combined them into one dessert…peaches, pralines and cobbler! Wonderful recipe and lovely pictures! Wow, you’ve got it all going on here! I can only imagine what a bite of your peach cobbler must taste like based on your ingredients and photos. Please pass the vanilla ice cream, I’m so bad, lol! Wow, two perfectly delicious goodies in one amazing dessert! I am bookmarking to make it this weekend! Peach crisps (crisps of any kinds) are a classic at our house – full of fruit and so easy to throw together. This would take a little more work, but what a fun idea – looks like cinnamon rolls on top! Oh, my! If I could marry a recipe, I would be on one knee right now! That looks soooo good! Cajun Joe I’m so conflicted when I see delicious recipes like this. The calories! Good job. What a fun way to put a dessert together.